The image shows a close-up of the colliding galaxies in red and green. The red data show dust-enshrouded regions of star formation. The green data show gas in the merging galaxies. The blue spots are visible-light observations of galaxies located much closer to us. Credit: JPL-Caltech/UC Irvine/Keck Observatory/STScI/NRAO/SAO/ESA/NASA. Two hungry young galaxies that collided 11 billion years ago are rapidly forming a massive galaxy about 10 times the size of the Milky Way, according to UC Irvine-led research published Wednesday in the journal Nature. Capturing the creation of this type of large, short-lived star body is extremely rare – the equivalent of discovering a missing link between winged dinosaurs and early birds, said the scientists, who relied on the once-powerful Herschel space telescope and observatories around the world. The new mega-galaxy, dubbed HXMM01, "is the brightest, most luminous and most gas-rich submillimeter-bright galaxy merger known," the authors write. HXMM01 is fading away as fast as it forms, a victim of its own cataclysmic birth. As the two parent galaxies smashed together, they gobbled up huge amounts of hydrogen, emptying that corner of the universe of the star-making gas. "These galaxies entered a feeding frenzy that would quickly exhaust the food supply in the following hundreds of million years and lead to the new galaxy's slow starvation for the rest of its life," said lead author Hai Fu, a UC Irvine postdoctoral scholar. The discovery solves a riddle in understanding how giant elliptical galaxies developed quickly in the early universe and why they stopped producing stars soon after. Other astronomers have theorized that giant black holes in the heart of the galaxies blew strong winds that expelled the gas. But cosmologist Asantha Cooray, the UC Irvine team's leader, said that they and colleagues across the globe found definitive proof that cosmic mergers and the resulting highly efficient consumption of gas for stars are causing the quick burnout. "Finding this type of galaxy is as important as the discovery of the archaeopteryx was in understanding dinosaurs' evolution into birds, because they were both caught at a critical transitional phase," Fu said. 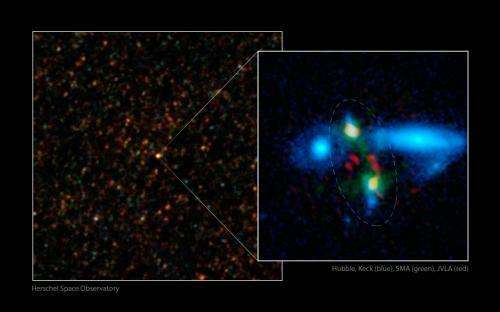 The new galaxy was initially spotted by UC Irvine postdoctoral scholar Julie Wardlow, also with Cooray's group. She noticed "an amazing, bright blob" in images of the so-called cold cosmos – areas where gas and dust come together to form stars – recorded by the European Space Agency's Herschel telescope with important contributions from NASA's Jet Propulsion Laboratory in Pasadena. "Herschel captured carpets of galaxies, and this one really stood out." Follow-up views at a variety of wavelengths were obtained at more than a dozen ground-based observatories, particularly the W. M. Keck Observatory in Hawaii. The claims in this story seem bound to conventional models. Where is the clear evidence? Just call it a "feeding frenzy" and claim you have explained things? Bunk. Physicists theorize that if you observed somebody falling into a black hole at the event horizon they would appear stationary and eventually the light from them would red shift farther and farther until they simply fade away, you would never see them fall past the event horizon. The Doppler effect used to measure distance in space time, the basis for the ever expanding universe and the appearance of the galaxies flying apart sounds a lot like the event horizon theory. Could the Schwarzschild radius actually extend to the boundaries of the galactic mass and the appearance of Doppler red shift for galaxies deemed to be moving away actually be caused by the black-hole mass at the center of galaxies? At the time Hubble observed the galaxies moving apart and the expanding universe theory, based on the Doppler effect black holes were not universally accepted nor evidenced until decades later. Hubble went to his deathbed not believing in the expanding universe he felt red shift was not a distance but a luminosity relationship. Schwarzschild radius like general relativity is wrong because space and time cannot be warped. Plasmoids are what is at the center of galaxies. No, for the Milky Way which is ~100,000 light years across, the Schwarzschild radius is just 0.2 light years. and the appearance of Doppler red shift for galaxies deemed to be moving away actually be caused by the black-hole mass at the center of galaxies? The light from distant galaxies gains energy falling into the galaxy so we see them slightly blue-shifted. The effect is small and since it depends only on our location in the well, it creates the same mount of shift for all galaxies. Note also that the mass of Sag A* is just 4.3 million Msun compared to about 300 billion Msun for the galaxy as a whole so the BH itself creates only a tiny fraction of that shift. No it isn't, the article is about an unjustified claim that the data supports a multiverse. In that model, every universe is of finite age just like ours and in fact since they are created by multiple phase change events, that model would rule out your hypothesis so you had better hope she is wrong. However, the multiverse model is entirely speculative at this stage. After all is said and done, the future Spiderweb Galaxy will appear as a massive(~10^13 Msun) radio-loud cD galaxy dominating a fair sized galaxy cluster (~2x10^14 Msun). The comparison of these two systems helps to illuminate the different paths galaxies take to reach maturity and to highlight some of the differences in galaxy assembly between field and cluster galaxies. Z, From the spider: "The new Hubble image is the best demonstration so far that large massive galaxies are built up by merging smaller ones." Once again, the statement falls from an assumption of conventional models. At the same time the article acknowledges the tremendous outflows of gas from the spider, and then goes on to "conclude" that the surrounding satellite galaxies are the source of the jets – rather than the consequence of the jets – and must therefore be in-falling, rather than out-falling. Astronomers are just stuck in their conventional models. I continue to be disappointed in their innate intelligence. The number of such claims increases every year. The trouble is that many versions of the multiverse are untestable, they will always be nothing more than speculation. The idea of brane collisions has been studied and no evidence found whatsoever. Of course, for deterministically thinking cosmologists the thousands of 60% indicia still don't count like the single 90% one. No, the problem is that while many people have made claims, there isn't a single indication at even 0.00001% level, it's all just talk. Consider the asymmetry in the Planck data: during inflation, there would be random variations in the density and some of those would be expanded to greater than our horizon. Within that region we therefore expect to see an overall gradient. To claim it supports a multiverse seems unjustified IMHO. Already much more massive than HXMM01 (~10^12 Msun), the Spiderweb Gal is surrounded by over a dozen star-forming satellite galaxies entrained in a vast web of Lyman-alpha emitting filaments. As these satellite galaxies orbit the main mass, stars and gas are being stripped from them to eventually form an extended outer halo around the Spiderweb Gal similar to that seen in other giant cD galaxies that inhabit galaxy clusters. An excellent summary and useful references, thanks for posting these.